An LLC member is an owner of the company. All owners of LLCs are classified as members. Just as the owners of a partnership are members of the company, LLC owners are legally members of the LLC. The rights and responsibilities of LLC members are specified in the operating agreement, but also defined by state LLC regulations. Since LLCs are state, not federal, creations, each state can have their own specific regulations, but owners in all LLCs are members. Managing members are those owners who are also empowered to manage the LLC. They are differentiated from "passive" members, who are investors only. Should the owners choose to have one or more of their group manage the day-to-day LLC operations, they are called managing members. They are authorized to make purchases, sign contracts, and obligate the LLC to binding agreements. LLC members have two management choices. These options are called "member managed" or "manager managed" LLCs. In most states, the owners must select one option at the formation of the company. LLC managers are like CEOs in corporations. They are employees, but not members. Their authority level to manage the LLC is granted by the members. An LLC manager may have the total authority of a managing member or may have specific responsibilities that are somewhat less than those of a managing member. LLCs are hybrid organizations, having some of the characteristics of corporations and partnerships. While members are owners, like corporation stockholders, their rights and responsibilities are more like the partners in a partnership. For example, unless modified by the LLC operating agreement, all members must agree on major decisions, for example, asset purchases. Requiring unanimous agreement is more akin to a partnership than simply having corporation stockholders vote on issues with the majority making major decisions. As owners, LLC members may participate in day-to-day management or simply be passive investors. Managing members act as CEOs of the LLC with authority to execute purchases and contracts, binding the LLC to legal agreements. At year's end, the LLC will "pass through" all profits to members, to be included in their personal income for tax purposes. The amount of profit/income members receive will match their ownership percentage. For example, a member owning 40 percent of the LLC will receive the same percentage of net profit to be taxed as personal income. How Do Capital Accounts in LLCs Work? An LLC's capital accounts allow the company to maintain an accurate accounting of each member's contributed cash or property: They are "running totals" of the members' ownership and investment. When forming a limited liability company, each member contributes a certain amount of cash or real property to the company. Often, although not necessarily, the amount each member contributes at the beginning forms the basis for his ownership. If two LLC members each contribute $50,000 to start a business, they will typically each own 50 percent of the business. Periodically, capital accounts are adjusted up or down to reflect profits or losses to the business, in accordance with each member's ownership and the terms of the operating agreement. When two or more people decide to start a business for a profit, the resulting agreement is called a partnership, governed by state law as well as individual contracts. 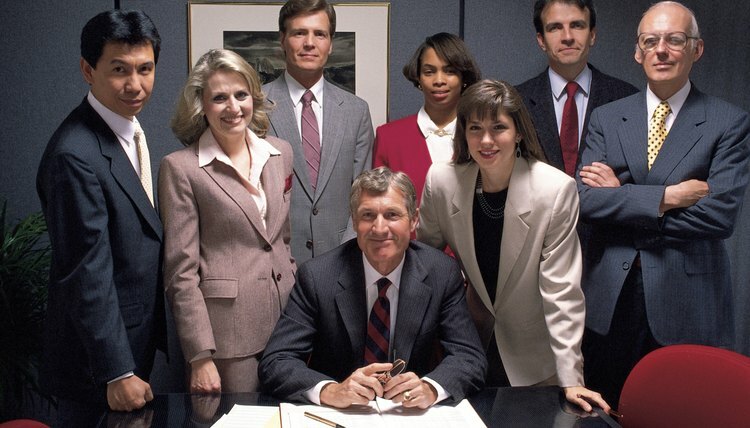 Following the creation of the business, the execution of a profit-sharing agreement is an important step in properly allocating profits and losses between partners and determining individual tax liabilities. If prepared properly, this written document will represent the true intentions of the partners. It does not necessarily need to be based on ownership percentages. Limited liability companies (LLCs) are owned jointly by a number of partners, called members. Members have the right to vote on a range of important company decisions, ensuring that members have a voice in the strategic guidance of the companies they own. Members do not have express voting rights granted by law; rather, individual members' voting rights are set forth by the members themselves in an LLC operating agreement. Establishing voting rights that are approved by all members can be vital to running an LLC smoothly and making timely strategic decisions. Does an LLC Have a Board of Directors?